Don’t put off this chore for another summer! I’ll show you how to stain a deck FAST, with the right tools and techniques for the job. 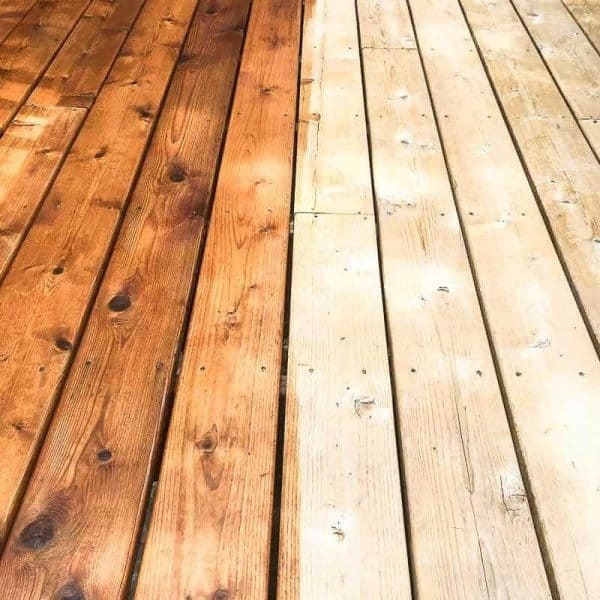 Is your deck stain worn and peeling? We tackle the chore of applying a new coat of stain every few years to keep the wood looking its best. 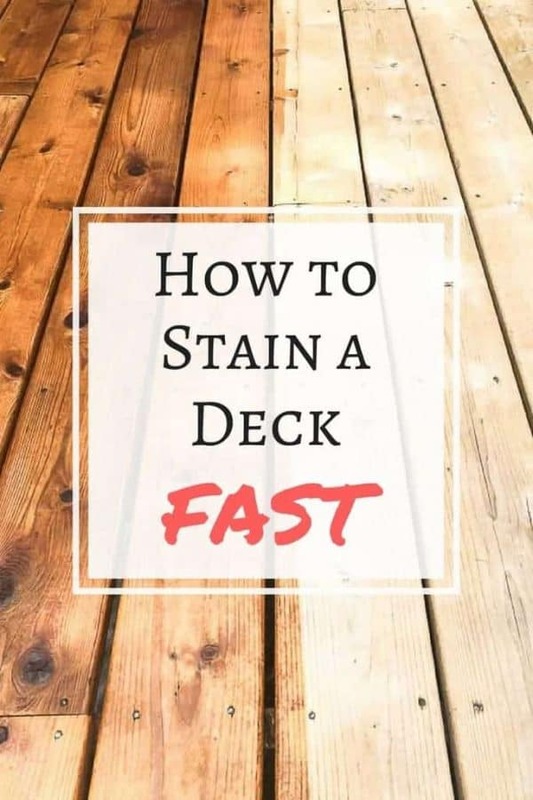 I’ve found how to stain a deck quickly and efficiently, so we can go back to hosting summer BBQs in no time! 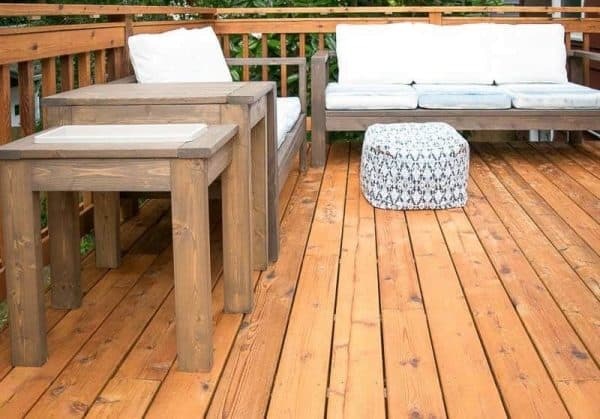 Before you pick up a can of stain, give your deck a good look. Are there popped nails or uneven boards? 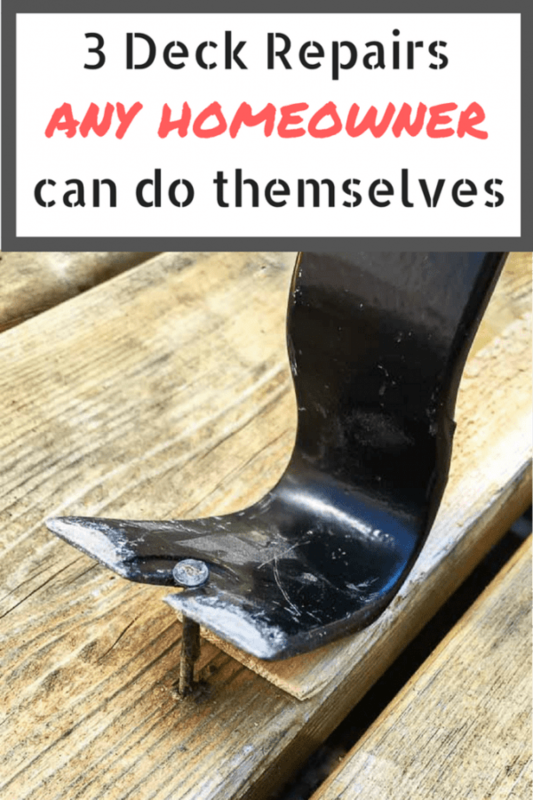 Here are some easy deck repair tasks any homeowner can tackle themselves. Fix the problems now, to make it easier to stain later. After repairing any issues, the wood needs a good cleaning. Stripping the old stain off is a good idea if it’s peeling, worn down or you want to change the color. It sounds daunting, but all you need is a power washer and the right chemicals. 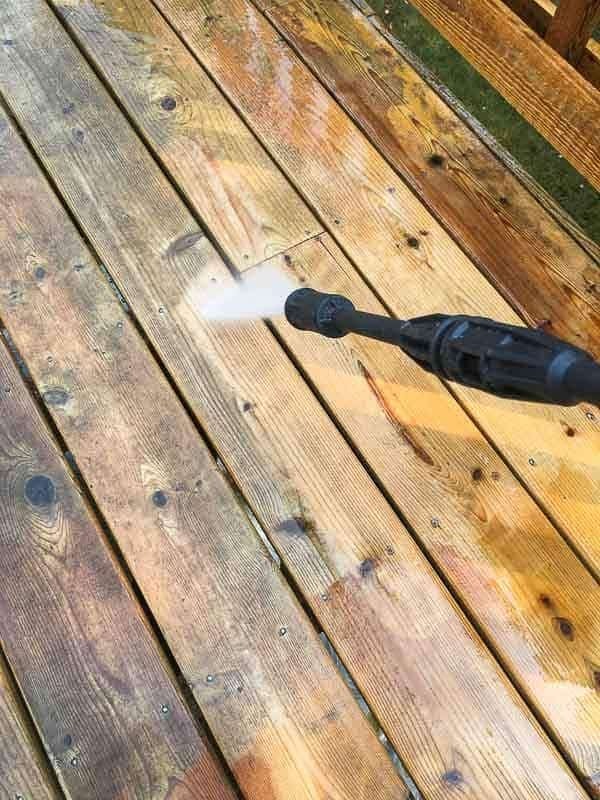 This tutorial on how to use deck cleaner and brightener will help make your deck wood look like new! With the wood sufficiently prepped, it’s time to make it shine again! I used three gallons of Ready Seal in the Natural Cedar color for my 300+ square foot deck. Homeright kindly provided me with their stain sprayer to try out for this project. 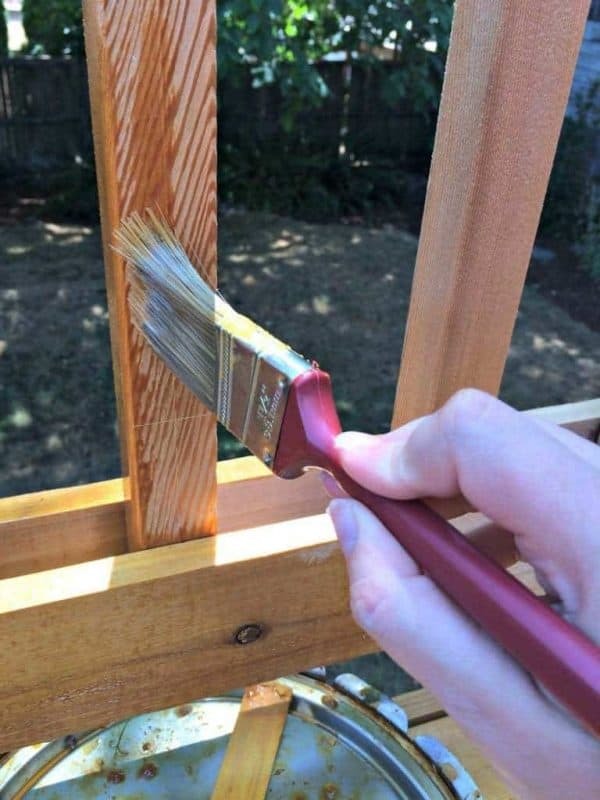 The first time I stained our deck, I made the mistake of doing the deck railings and spindles with a paint brush by hand. It took for-ev-er! 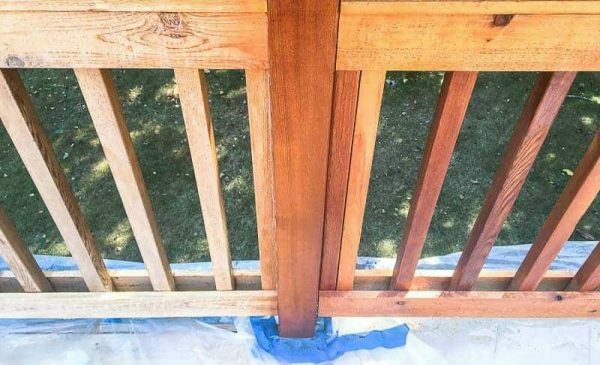 Now I’ve learned how to stain deck railings fast! Meet my secret weapon . . .
Lay down plastic tarps on the deck floor and over any plants or furniture you don’t want covered in stain. Pour the stain into the reservoir, and don your face mask. Even though you’re outside, a light gust of wind can send a cloud of stain right back into your face! Working from the top down, spray a light coat evenly over every surface. Keep a paint brush on hand to catch any drips. Within minutes, I had an entire section complete! Below you can see how well it coated the section on the right. A word of warning: the light mist of stain that falls on the plastic tarp makes it incredibly slippery! But if you leave the surface of the deck uncovered, the drips and splatters will ruin the finished look. I decided not to risk my neck on the stairs and tackled those spindles by hand. But I saved days of work by spraying the rest! With the railings complete, it’s time to move on to the floor boards. Remove the tarps from the floor, but keep them on any plants or items under the deck. Move any furniture to one side so that the entire length of the floor boards is exposed. Pour stain into a paint roller tray, and dip the Shur-line stain pad into it. Don’t get it too saturated or it will drip. With the groove tool retracted, stain the entire length of one board from end to end. Stopping and starting on the same board will leave overlap marks, so make sure to finish the entire length before it dries. Now here’s the cool part about this particular stain pad. Flip the handle around, and the groove tool extends. Now you can get in between the floor boards without resorting to a paint brush! 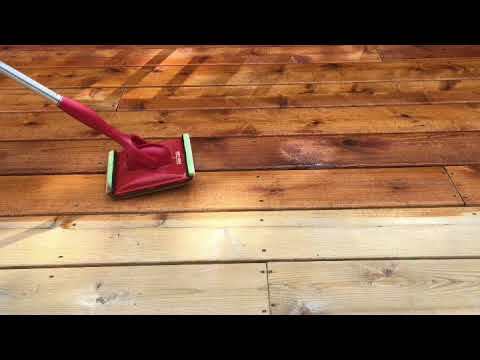 This quick video shows you how to stain a deck super fast with this tool. I stained half of the deck in less than an hour, then let it dry overnight. The next day, I moved all the furniture to the stained side and completed the job. 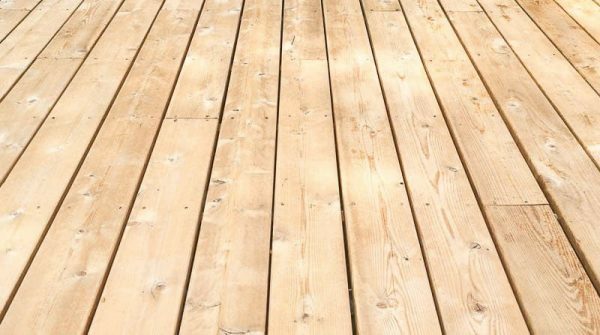 If you have a completely empty deck, you could complete this entire task in an afternoon! Once everything was dry to the touch, I moved everything back into place. Time to relax! I’m hoping that this new stain will last longer than the previous one. Ready Seal gets great reviews, and is very easy to apply. The color was much brighter than anticipated at first, but mellowed to a more natural color after a week or so. 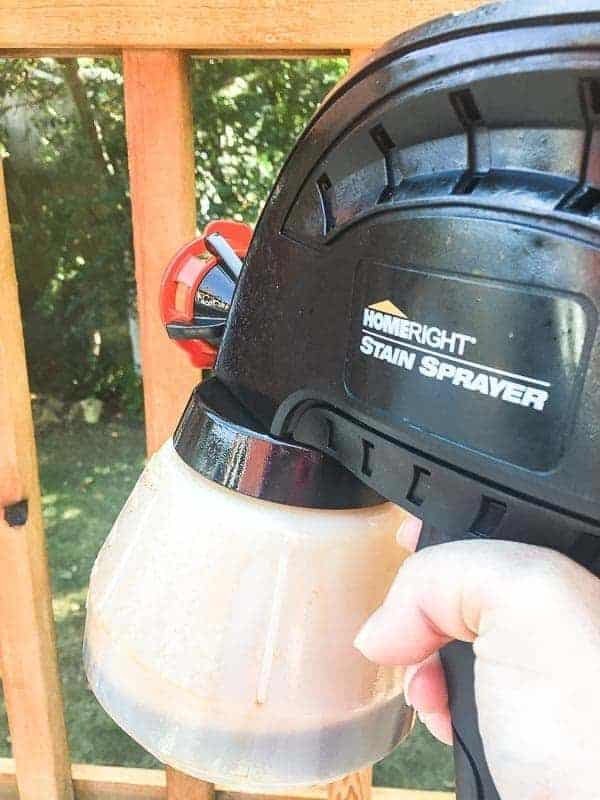 Now you know my secrets for how to stain a deck super quick! You could easily knock this project out in a weekend and be back to grilling and entertaining al fresco in no time! If you would like to keep up to date with my latest posts about woodworking, home improvement and more, you can follow me on Facebook, Pinterest, or Instagram. You can also sign up for my email list below and get access to my woodworking plans library! 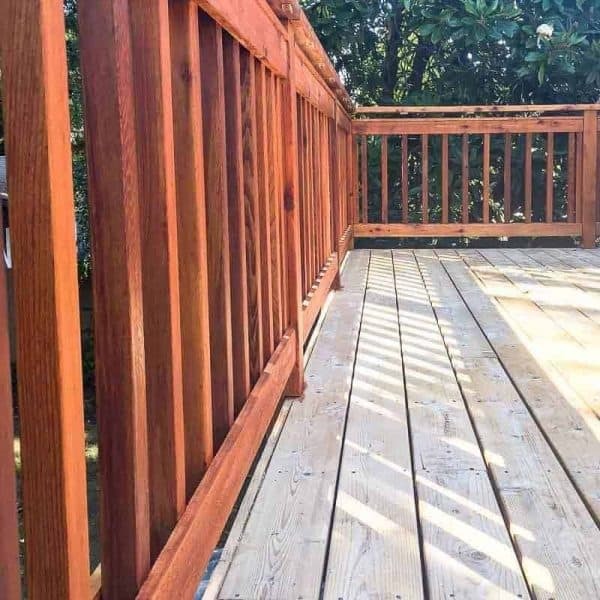 Your deck looks beautiful and great tips to get it done easy and quickly, Thanks for sharing at Merry Monday. Hope to see you at the party next week! 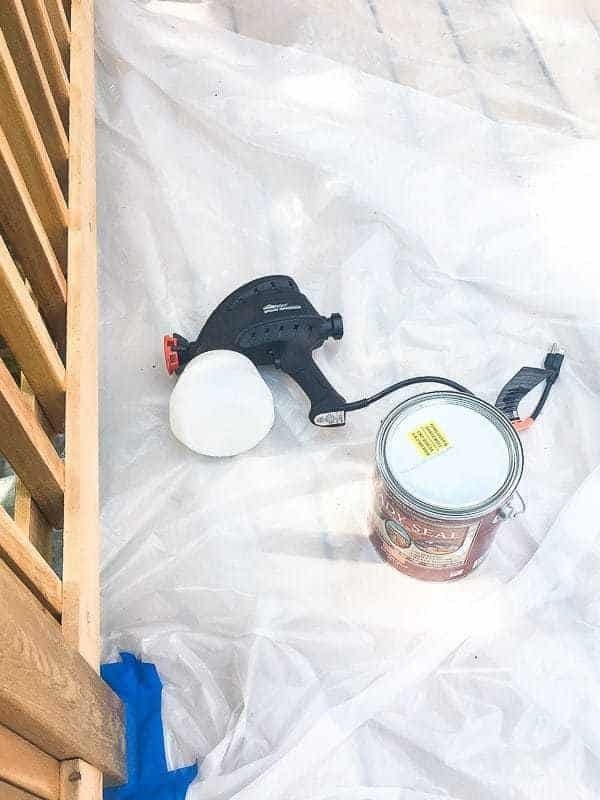 I like your idea to take a good look at your deck before you start staining so that you can do any quick repairs that need to be taken care of. My husband wants to get our deck fixed up for the summer so that we can have friends over and spend more time outdoors. I think it would be really helpful if we had a professional to take care of the staining, since we don’t know too much about that kind of thing. How does the groove tool work when the gaps between the boards are uneven? We have a few spots where the gaps are uneven too. I pressed the groove tool to one side of the gap and ran it down the board, then pressed it to the other side on the way back.